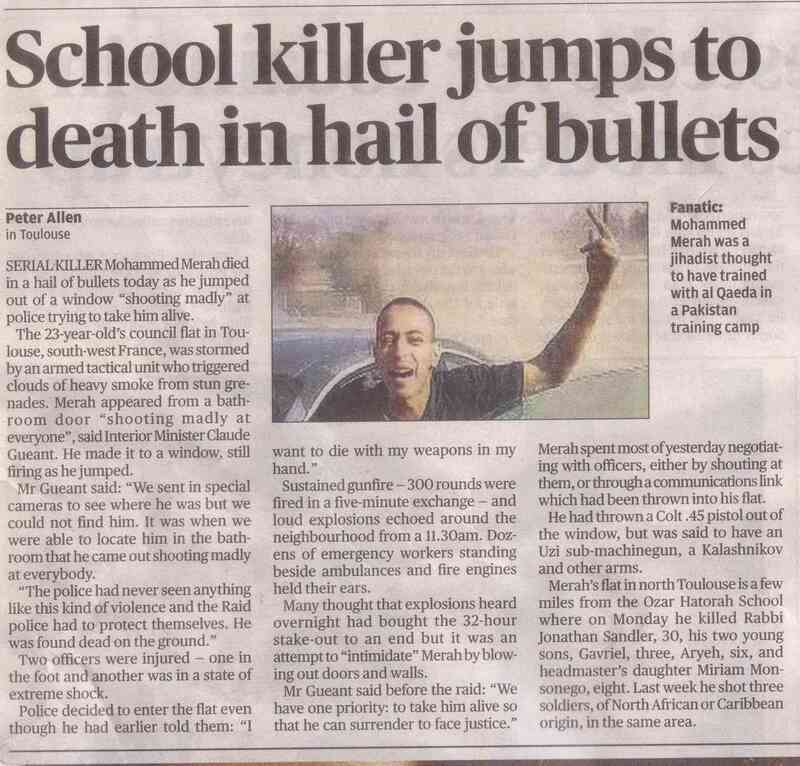 The Evening Standard - now part of the anti-Israel Independent and Independent on Sunday group produced an outrageous blood libel against Israel on 12 March stating the lie that Israelis had killed a Palestinian schoolboy. After I made a formal complaint that case is currently being dealt with by the Press Complaints Commission (I have had a response and an offer from the Editor to resolve, but have not accepted it and have made a counter proposal; once the case is resolved I will reveal some of the very interesting details involved). 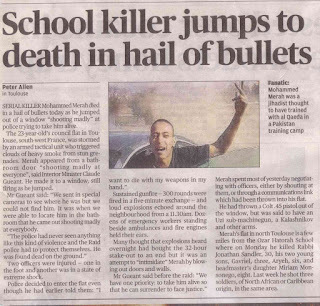 Yesterday the Standard reported on the outcome of the Toulouse killer's confrontation with the Police - it was buried on page 12. I have scanned it here. Although the picture caption does state that Merah was a jihadist, the lengthy piece simply describes Merah as a "serial killer". There is not a single mention of the killer's religion, Jihadist motivation, nor the mass of Jihadist anti-Semitic statements he, and the Islamist group he was a member of, had just made. In particular they make no mention of Merah's statement that he wanted to kill Jews to 'avenge Palestinian children killed by Israel' (I wonder where he could have got that erroneous idea from?). The article also avoids telling readers that the school he targeted was a Jewish school. There are many developments of the story about the whole change of narrative on Toulouse (Sultan Knish has a typically incisive article). Now the media is telling us that the real victims are not Jews but Muslims who 'fear a backlash', and there are the interminable reports describing an alternative reality in which there is no anti-Semitism in France and especially no Muslim anti-Semitism (why after all should the media believe what Jews who live in Toulouse say after all? and the hundreds of attacks by Muslims on Jews in the last 5 years obviosuly never really happened). But the most bizarre reporting I have seen comes from, of all places, the supposedly 'conservative, pro-Israel' Fox News, whose reporter in Toulouse (and yes he really was there) did not once refer to the fact that three tiny Jewish children had been murdered. He kept saying (and I saw him say this several different times) that 'a teacher and three students' were murdered. And, incidentally, Fox News stopped being pro-Israel more than two years ago. There is no longer any main stream media outlet that is telling the truth. The truth is the new 'hate speech'.